The Champions Classic doubleheader will undoubtedly be the highlight of Tuesday's 24-hour tip-off marathon, but there have been a handful of other games worthy of your espressos and energy drinks. Here's an early look at the winners and losers. Check back later for more analysis because this post will be updated throughout the day. Given the amount of hype for these three phenoms' first collegiate games on a big stage, it's beyond impressive each of them were as good as advertised. Randle shook off a turnover-plagued first half and willed Kentucky back into contention against Michigan State in the second half, scoring 27 points, grabbing 13 boards and showcasing strength and explosiveness in the post. Parker blitzed Kansas for 27 points and nine rebounds, demonstrating an ability to sink jumpers from the perimeter, to score off the dribble or to finish an alley-oop above the rim. And Wiggins overcame a foul-plagued first half to become the only one of the three to lead his team to victory, scoring 22 points, grabbing eight rebounds and sealing the victory with a step-back jump shot and a transition dunk in the final two minutes. There are things all three needs to work on: Randle must knock down his foul shots, Parker could become a better passer and Wiggins needs to show the aggression he had in the second half at all times. But rather than tearing one down to build up another, for at least one night let's give all three credit for outstanding performances. With Mason Plumlee and Ryan Kelly lost to graduation and Marshall Plumlee not ready to play heavy minutes, Duke's defense this season was always going to lack a big man capable of protecting the rim. That problem was compounded Tuesday night against Kansas by the fact that the Blue Devil perimeter players couldn't play their usual extended man-to-man without picking up fouls. New rules cracking down on hand-checking contributed to Tyler Thornton and Jabari Parker fouling out and Rodney Hood, Quinn Cook and Rasheed Sulaimon picking up four fouls apiece. Kansas got in the lane at will, shooting 56 percent from the field and going to the foul line 35 times. Of course not every opponent Duke plays is of Kansas' caliber, but this is still a major concern. If the Blue Devils are going to be one of the nation's elite teams, they'll have to figure out how to adjust to the new rules, make up for not having a shot-blocking center and keep opposing slashers out of the lane. For all the attention heaped on Andrew Wiggins, Julius Randle and Jabari Parker the past few days, none of their teams will be the No. 1 team in the nation next week. That label will belong to Michigan State after the No. 2 Spartans survived a second-half Kentucky surge and emerged with a 78-74 victory over the top-ranked Wildcats. Gary Harris had a strong 15-point first-half, Adreian Payne was dominant until foul trouble forced him from the floor and Keith Appling picked up the slack with his scoring and decision making in the second half. Whereas Kentucky certainly would have liked to have won this game, it was more important psychologically for the Spartans. They had to win in November when the Wildcats were turning the ball over, missing free throws and failing to get back in transition to realistically believe they can do it again in March when Kentucky will have cleaned up some of those problem areas. Yes, Michigan State will be better in five months too -- Tom Izzo teams always are -- but a freshman-laden team like Kentucky has more room for growth. If the missed free throws, maddening turnovers and hail of transition breakdowns are all correctable for Kentucky, the one problem that may be more complicated is the struggles of the Harrison twins. Andrew Harrison had a decent scoring night with 11 points, but his defensive miscues and five turnovers were alarming, especially some ill-advised passes as the Wildcats were launching their comeback. Aaron Harrison forced shots and failed to make a positive impact on either end of the floor, finishing 1 of 7 from the floor and 0 of 5 from behind the arc. Also disconcerting was that TV cameras caught both twins sulking or displaying poor body language on the floor when things didn't go their way, a longtime issue for both on the AAU circuit. It's not like the Harrisons are the first highly touted freshmen to struggle in their first big games -- neither Tyreke Evans nor Derrick Rose in their first month or two under Calipari. But fans, media and NBA types will be critical after a poor performance on a big stage and it's up to the Harrison twins to respond. Of the 37 teams who have started 2-0 so far, none has two better victories than UMass. Two days after dispatching in-state foe Boston College on a neutral floor, the Minutemen survived a late comeback bid to topple rapidly improving LSU 92-90. Granted UMass faded after a strong start last season, but two early resumé wins are noteworthy for a Minutemen program trying to make the NCAA tournament after two straight NIT bids. Even more promising, A-10 player of the year candidate Chaz Williams has more help this season than he did a year ago. Oh sure, Williams is averaging 22 points in the two UMass victories, but the frontcourt is also blossoming. Now fully healthy and in better shape, 6-foot-10 Cady Lalanne has scored 43 points on 20 of 25 shooting in two games and had a huge second half to propel the Minutemen past LSU on Tuesday. Forwards Sampson Carter and Raphiael Putney have also been active on the glass and in the paint. If that continues and Western Kentucky transfer Derrick Gordon continues to shake off the rust, UMass has the potential to challenge VCU, Saint Louis and La Salle in the Atlantic 10. Is there a worse way for an elite freshman to debut? Martin, a 6-foot-9 forward rated No. 13 in his class by Rivals.com, tweaked an ankle in the opening minute of his first collegiate game at UMass and sat out the rest of the way. LSU remained competitive on the road without him thanks to huge games from fellow forwards Johnny O'Bryant and Jordan Mickey, yet it's hard not to think a McDonald's All-American with a smooth inside-outside game couldn't have made a difference in a 92-90 Tigers loss. There's no huge rush now to get Martin back since LSU's next three games are against Northwestern State, New Orleans and Southeastern Louisiana. As long as Martin is back by the Old Spice Classic over Thanksgiving weekend, the Tigers should be fine. Only two conferences are still unbeaten four days into the regular season: The powerful Big Ten and the perpetually underrated WCC. Gonzaga, BYU and Saint Mary's helped the WCC improve to 15-0 so far this season with a trio of dominant victories Monday night. The Zags got things rolling with a convincing 92-61 victory over rebuilding Colorado State behind eight 3-pointers from junior guard Gary Bell. Up next were the Cougars, who ran Stanford out of its own gym 112-103 thanks to a potent transition attack powered by Matt Carlino (26 points) and Tyler Haws (31). And finally, 16 points from Brad Waldow and 15 from James Walker helped Saint Mary's pull away from Akron in the second half for an 85-63 rout. The WCC's unbeaten streak will surely end soon -- maybe Tuesday when Pacific hosts Big West favorite UC Irvine or perhaps Wednesday when Portland visits Oregon State. Nonetheless, the top of the league once again looks formidable enough to produce multiple NCAA tournament teams. Dawkins is under fire entering his sixth season at Stanford mostly because he has been unable to parlay stellar recruiting into an NCAA tournament bid. An experienced starting lineup appeared to give Dawkins his best chance to accomplish that goal this season, but Monday night's 112-103 home loss to BYU suggested the Stanford coach still may not be able to get his team to play to its potential. Having lost small forward Andy Brown to a career-ending fourth torn ACL, Dawkins had to decide this offseason whether to start three big men or three guards. He went with the former, which so far has transformed 6-foot-7 Josh Huestis from an effective interior scorer and defender into an ineffective spot-up shooter. 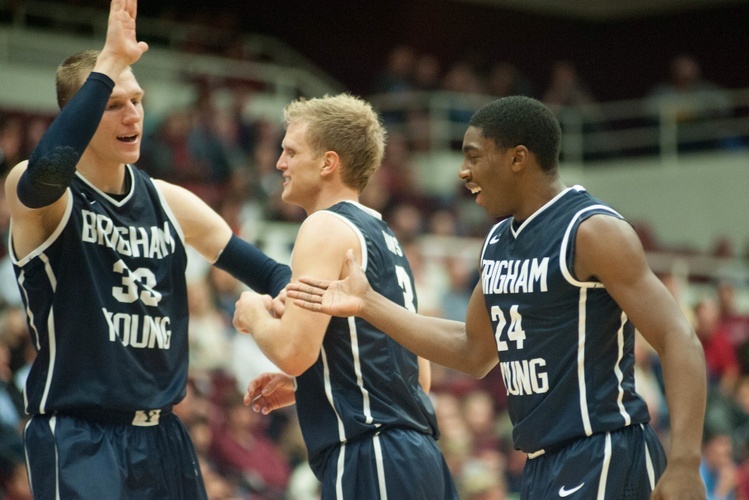 Perhaps that decision is defensible if Dawkins trusts his frontcourt depth more than his reserve guards, but what's inexcusable was allowing the big lineup to try to run with guard-oriented BYU. That negated Stanford's frontcourt advantage, turned the game into a track meet and cost the Cardinal any chance at an early resume-boosting win. Five days after he was surprisingly omitted from Baylor's starting lineup in favor of Gary Franklin to begin the season, shooting guard Brady Heslip is doing everything he can to prove that was the wrong decision. On Friday, Heslip lit up old nemesis Colorado for four threes off the bench in a season-opening win. On Tuesday, Heslip sank five from behind the arc against South Carolina and scored a team-high 18 points to save a sluggish Baylor team from what would have been a discouraging loss. The Bears won despite committing twice as many turnovers as the Gamecocks, shooting a horrific 22 of 41 from the foul line, failing to exploit their matchup advantages in the frontcourt and not tallying a single field goal for the game's final seven minutes. Some of the credit goes to Baylor's defensive effort in the final minutes, but Heslip's shooting was also a big reason the Bears weren't playing from behind. The criticism of Heslip is that he doesn't do enough besides shoot to justify playing him more than 15-20 minutes off the bench, but sitting him is a luxury the Bears do not have. Not only is Heslip the only Baylor guard who can consistently knock down a jump shot, neither Franklin nor Ish Wainright are consistently productive enough to merit sitting the Canadian sharpshooter. Here's an overly simplistic but telling measure of where West Virginia is as a basketball program right now: South Carolina-Upstate was good enough to go into Blacksburg and defeat rebuilding Virginia Tech, but West Virginia was not. Despite building a 17-point first-half lead after this emphatic Juwan Staten dunk, the Mountaineers could not make it stand up, surrendering a 10-1 run to end the first half and a 15-1 run to start the second half to enable the Hokies to emerge with a 87-82 win. West Virginia shot a horrific 11 of 46 from inside the arc, but it was the Mountaineers' defense that upset Huggins most. He felt his team's urgency on that end decreased once it built a big first-half lead. "I've got a whole bunch of freshmen who don't understand how hard you have to play," Huggins told reporters after the game. "We got up, and we stopped guarding. And when you stop guarding, people take advantage of you." For a West Virginia team that lost more than half its rotation from a team that already went 13-19 last season, the expectation is that this will be a rebuilding season. Losses like this one to one of the ACC's lower-echelon teams only cements that the Mountaineers are at least a year away from regaining relevance. If the biggest challenge facing Wichita State this season is filling the void left by steady point guard Malcolm Armstead and top big man Carl Hall, then the performance of both their replacements Monday night had to be encouraging. Sophomore point guard Fred VanVleet built on the late-season flashes he showed as a freshman last spring, scoring a team-high 17 points to lead the Shockers to a 66-49 victory over Sun Belt contender Western Kentucky. The former top 100 recruit was active defensively, made good decisions with the ball and showed an ability to both hit from the perimeter and get to the foul line. Maybe the bigger surprise was Kadeem Coleby's effectiveness. The ultra-athletic 6-foot-9 junior college transfer scored six of his 13 points during an 11-0 early-second-half spurt that helped the Shockers put away the Hilltoppers. Wichita State didn't get a ton of offense from returning standouts Cleanthony Early and Ron Baker, but chances are that will come sooner than later. And the way they defended to go along with the production from VanVleet and Coleby, the Shockers didn't need it Monday. A home loss to a solid-but-unspectacular Kent State team Monday night only underscored the obvious about Temple this season: The inexperienced Owls may not be capable of extending their streak of six consecutive 20-win seasons. A lack of firepower was supposed to be the primary issue for Temple after the graduation of high-scoring Khalif Wyatt and fellow threats Scootie Randall and Rahlir Hollis-Jefferson, but Will Cummings and Quentin DeCosey have helped soften the blow. The real issue for the Owls Monday night was poor defensive rotations that contributed to torrid Kent State shooting from behind the arc. Temple also regressed on both ends of the floor down the stretch just as it did in its previous win over Penn, enabling Kent State to erase an eight-point second-half deficit and notch an 81-77 win. The silver lining is Temple may improve in both areas as it matures, but it may not matter for this season unless the Owls progress quickly. The top of the American Athletic Conference is too strong for Temple to saddle itself with too many early non-league losses.